The frustrating wait for information continues. We haven't heard from the spacecraft yet. Nor have we heard of a crash site. Nor have we convinced ourselves of the detections at those ground stations. Hope continues to diminish, but it remains. Who knows, maybe someone will look upward on June 26 after 04:40 UTC, and see a bright spot moving across the sky. Update 21-Jun-2005: Cosmos 1 is now scheduled to be launched today at 3:46 pm EST in the Barents Sea. A three-stage Volna rocket will launch the satellite into a near circular polar orbit. 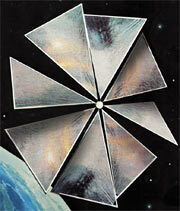 Cosmos 1, the world's first solar sail spacecraft, is scheduled to be launched on March 1, 2005. The mission of the flight is to perform the first controlled solar sail flight. 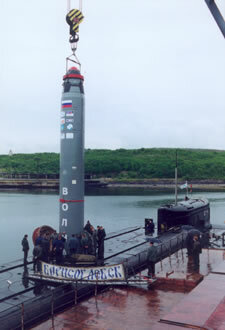 The launch will be performed by the Russian navy; Cosmos 1 will reach space propelled by a Volna rocket taken from the operational intercontinental ballistic missile inventory, and fired from a submerged submarine. Cosmos 1 is a private venture financed by The Planetary Society. The spacecraft is the result of the efforts of a mostly Russian team of scientists and engineers. The Space Research Institute in Moscow oversaw development of flight electronics and mission control software. The craft itself was built by NPO Lavochkin, a Russian aerospace company. American consultants provided additional components. Cosmos 1 uses reflected light pressure on its large sail for propulsion. The 600-square meter sail will have eight blades (see illustration above), configured like a windmill. The sail will be deployed by inflatable tubes, which will also make the structure rigid. If successful, it should be a naked eye object visible from most of the world. Cordwainer Smith wrote another story in 1963 with more descriptions of this technology: "immense sails - huge films assorted in space on long, rigid, coldproof rigging." Arthur C. Clarke's 1964 story "Sunjammer" details the story of a race of seven sun yachts and was published in Boy's Life. "The intruder came from here. Whoever launched it fired a laser cannon, or a set of laser cannon - probably a whole mess of them on asteroids, with mirrors to focus them - for about forty-five years, so the intruder would have a beam to travel on." Get updates on Cosmos 1 at the Cosmos 1 Mission Tracking Site. Thanks to space.com for the story.